The Simpsons: Pay Cut or Cancellation? After 23 seasons on the air, the cast of The Simpsons and the overlords at Fox are fighting over their salaries, this time putting the future of TV's most iconic animated family in jeopardy. Twentieth Century Fox Television, the owners of The Simpsons say they have to cut the six starring voice actor's salaries by almost half or face cancellation before their 24th season. This means a 45% cut to each of their $8 million annual salaries. This includes Julie Kavner, who plays Marge, Patty and Selma, Nancy Cartwright who plays Bart, Nelson Muntz and Ralph Wiggum and Dan Castellaneta who plays Homer, Grampa Simpson, Krusty the Clown, Barney Gumble, Groundskeeper Willie, Mayor Quimby and Hans Moleman. It also includes Hank Azaria who plays Moe Szslak, Chief Wiggum and Apu and Yeardley Smith who plays only Lisa Simpson. Voice actor Harry Shearer, who plays Mr. Burns, Waylon Smithers, Principal Skinner, Dr. Hibbert, Ned Flanders, Reverend Lovejoy, Rainier Wolfcastle and Otto, has broken away from his Simpsons family to propose a different deal. He's asking for an even bigger pay cut at 70%, but wants a slice of the profits from the Simpsons empire, including syndication, branding and merchandise. Shearer says this is something Fox has always denied the cast. The opportunity to share in the backend that has generated reached billions of dollars over the years. The Simpsons creators, Matt Groening and James L. Brooks have always been given a share of the profits. But Fox wont budge with the performing cast. This latest fight between the Simpsons cast and Fox has been their most public, but not the first. The first dispute was in 1998 at which time each cast member was being paid only $30,000 per episode. The cast wanted more money which Fox denied at first, even threatening to replace them with new voice actors and went as far as preparing to audition new voices. Simpsons creator Matt Groening supported the cast and their pay was raised to $125,000 per episode. In 2004, the profits of The Simpsons was rising fast with massive syndication deals for reruns and DVD sales. The cast went on strike and stopped showing up for script readings. They demanded a raise to $360,000 per episode, with Fox negotiating a rate between $250,000 and $360,000 for the main cast members. When The Simpsons 20th season was in production in 2008, the cast called for another new contract negotiation demanding $500,000 per episode. Fox settling at $400,000. Now Fox is asking the people of Springfield to give up 45% of their salary to remain profitable. With The Simpsons massive global popularity contributing to the growth and success of the Fox network through the 90s until today, I'm surprised that Fox and The Simpsons have any history of disputes at all. 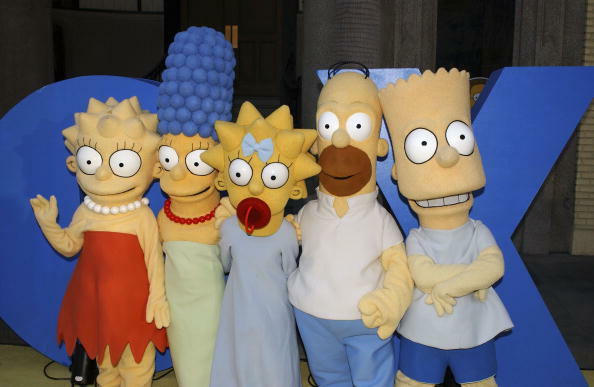 Which party do you side with: Fox, The Simpsons cast or Harry Shearer? Do you think that Fox will actually cancel The Simpsons after all these years? Or do you think The Simpsons has run its course and is due to retire anyway? UPDATE, Oct.10/11: The cast of the Simpsons have signed on for two more seasons, meaning that they will finish their 25th season before another dispute. The details of the new deal haven't been released, but it's rumored that the cast settled somewhere around a 30% pay cut. Entertaining audiences since 1989, The Simpsons are about to reach heights that no scripted television show has ever achieved. Harry Shearer has made a lot of money during his career as an actor. But according to a recent lawsuit, he's missed out on millions of dollars from the hit movie "This Is Spinal Tap."